The notion that America's two major political parties are fundamentally different sorts of animals is not new. But this idea has been out of fashion for some time, particularly in the balance-obsessed media, where anything said about one party must quickly be balanced by saying something similar about the other. But a new book should help to change all that. The book has marshaled an impressive array of data to examine the parties at every level, as successive chapters go from individual voters' opinions, through how parties organize (with their affiliated networks), to public-policy issue debates ("including the unique influence of conservative media and the different uses of scientific research by each party"), then to political campaigns and finally to parties in government. The Democratic Party “fosters a relatively pragmatic, results-oriented style of politics in which officeholders are rewarded for delivering concrete benefits to targeted groups in order to address specific social problems,” the authors wrote. In contrast, the Republicans are more prone to “forge partisan ties based on common ideological beliefs, encouraging party officials to pursue broad rightward shifts in public policy." Thus, the authors concluded: "Republican voters and activ­ists are more likely than their Democratic counterparts to prize symbolic demonstrations of ideological purity and to pressure their party leaders to reject moderation and compromise." Each party reflects something deeply rooted in American culture. For the Democrats, it's America's pragmatism: the can-do determination to solve problems, using whatever means come to hand. For Republicans, it's the notion of America as a land of unfettered freedom and opportunity. Both approaches enjoy broad support, which can lead each party to overestimate how popular its formulations are when they come into conflict with the other's. In that limited sense, there's a symmetry involved: Both parties tend to overplay their hands and fail to grasp what they're missing. But they're not even playing the same game. The wealth of the book's hard data — public and activist opinion, the content of speeches, their parties’ relationships with interest groups — is a solid foundation for the authors to build up their argument. And the authors explain how America's politics are distinctively different from other countries' noting that “the Republican Party stands alone among [other parties in] comparable democracies in its broad ideological commitment to conservatism,” they wrote. 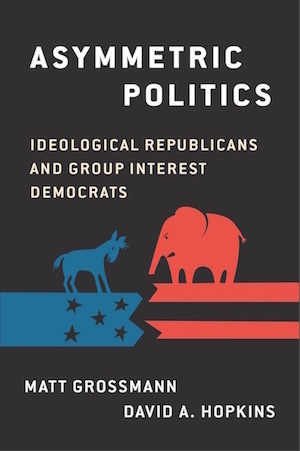 Perhaps most persuasively, the book provides a coherent narrative framework to make sense of what otherwise appears to be a great deal of recent political turmoil, driven by the growing demographic diversity of the Democratic coalition on one side and the growing insularity of the Republicans on the other. After all, the Republicans are supported by their own conservative media universe, are indulging in ever more extreme acts of legislative intransigence and producing even more extremist factions, like the Tea Party and Trump’s core supporters. These are not a jumble of one-off historical events but rather ongoing processes that have increased the degree of asymmetry between the parties. While Donald Trump may not be a conventional conservative, his emergence as a Republican candidate clearly results from recurrent internal conflicts in the GOP due to its sharp focus on ideology, which seems to becoming ever more conservative, and an inability to satisfy pragmatic public demands while maintaining ever more intense purity of principles. The authors asserted there’s a problem for both parties when they revert to their fundamental tendencies — when Democrats pay too much attention to delivering social programs and when Republicans are too faithful to conservative ideology. “As Gingrich discovered in his showdown with Clinton, the public’s preference for limited federal power in the abstract often dissipates when voters are confronted with potential cuts to particular services," the authors wrote. At the same time, they noted that the Democrats can be surprised by the same pattern in reverse: "Clinton’s once-popular goal of implementing universal health insurance failed after Republicans in Congress successfully characterized it as a left-wing scheme to impose government control over the health care system and reduce the freedom of private citizens." Both parties would be wise to learn from the authors about the potential for political paralysis that results from their performance in carrying out actions in keeping with their general tendencies. The Democrats finally managed to have Obamacare passed, only to see Republicans sweep to power in the House by running against it and then plunging the government into prolonged gridlock. Republicans found themselves incapable of proposing anything concrete to replace Obamacare with, despite scores of votes to repeal it, and the frustration that was generated as a result disenchanted many GOP voters, opening the way for Trump's rise. I join with the authors in believing that it would be wise for both parties to learn from their mistakes. Yet these lessons are difficult to learn — for both parties — precisely because their different natures are etched into each operation at every interconnected level. This is a worthy goal but anyone who's read the book faithfully can't help but see that it might be impossible because Republicans reject the pragmatic mindset on ideological grounds. “We do hope that conservatives can learn from Democrats' pragmatic approach,” Grossmann told Salon. Compared to the richness and power of the book's analysis, these prescriptions seem a bit pallid, if well-intentioned. But that's to be expected. They're only a bare starting point. It's only after folks begin seriously debating within this new, realistic framework of understanding that we should expect truly vigorous, robust new solutions to emerge. Let the debate begin!